Seven Proofs of God's Church: Proof 6 - God's True Church Is Organized! 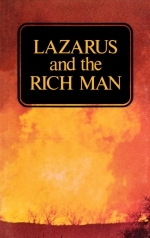 Thousands have asked for the true explanation of the "rich man and Lazarus." Here is what the Bible really says! Stop and think! Would you really want to spend eternity in a heaven where you would be forced to gaze constantly upon your own loved ones who were lost, hearing them frantically screaming to you for help you would be unable to give, watching incessantly their indescribable agony, as they are on fire — burning to death — yet never really burning up? Would you be happy? Yet that is exactly the kind of "heaven" that is being pictured by many religionists. Many of them rely more on Jesus' account of Lazarus and the rich man than any other scripture to support their teaching that the "saved" go instantly, at death, to heaven while the lost leave their bodies and are plunged into an ever burning inferno of eternal torture. Those who deny that anyone goes to heaven or to hell at the instant of death maintain the account of Lazarus and the rich man is merely a parable. But the "immortal soul" advocates insist this is not a parable. Jesus was stating facts that had happened, they argue. So let's pretend this was not a parable. Let's take it literally. Jesus surely meant exactly what He said. But even then He did not say what is popularly believed! Lazarus here is pictured as a person, perhaps even a Gentile, who received salvation. Do Gentiles, upon being converted and becoming Christ's, enter into any intimate relationship to Abraham? They certainly do! To the Gentile born Galatians, the scriptures written by Paul say definitely: "And if ye be Christ's, then are ye Abraham's seed [children], and heirs according to the promise" (Gal. 3:29). Through Christ they become the children of Abraham. Through faith we all become "the children of Abraham" (Gal. 3:7). That is an intimate relationship with Abraham. That is being taken into Abraham's bosom! Now Abraham is an heir of God. God gave Abraham a promise. Notice (Gal. 3:29), those who through Christ become Abraham's children are heirs — but heirs according to the promise God made to Abraham. Now what did God promise Abraham? To what promise was this beggar now an heir? Did God promise Abraham and his children heaven? Let's not put any interpretation upon the sacred Word of God. No scripture is of any private interpretation — it is interpreted by other scriptures. It ought not to be interpreted by man. "And Abram took Sarai his wife ... and they went forth to go into the land of Canaan; and into the land of Canaan they came .... And the Lord appeared unto Abram, and said, Unto thy seed will I give this land" (Gen. 12:5-7). The land of Canaan is on this earth, not up in heaven. This beggar through Christ became "Abraham's seed" — in the intimate relationship of one of Abraham's children. Then God included this beggar when He said: "Unto thy seed will I give THIS LAND. Again, later, God promised Abraham: "For all the LAND which thou seest, to thee will I give it, and to thy seed FOREVER (Gen. 13:15). Again, still later: "In the same day the Eternal made a covenant with Abram, saying, Unto thy seed have I given this land, from the river of Egypt unto the great river, the river Euphrates" (Gen. 15:18). Here God wrote into the agreement, or the title to the property, the very boundary line of the property. Of course the expression "thy seed" refers in particular to Christ, but since this beggar was Christ's, he also was "Abraham's seed, and heir according to the promise." Now notice an important point. The beggar was carried by the angels into Abraham's bosom — that is, by Bible explanation, he became one of Abraham's children, and therefore he became an heir to the land on this earth and eternal life. The next question is, when was this beggar to inherit — to come into possession of — eternal life in the promised land? Jesus, in telling about Lazarus and the rich man, did not cover that point. He only told what happened, not when. We must find the answer, not in human imagination or the false teaching of man, but in the Bible! When, then, did Abraham actually receive these promises? The startling answer of Scripture is — he didn't! He has not, even yet in our day, inherited these promises! Scripture reveals the answer through the inspired speech of the very first Christian martyr, Stephen, who was stoned to death for these very words. "And he said, Men, brethren, and fathers, hearken; The God of glory appeared unto our father Abraham ... and said unto him, Get thee out of thy country, and from thy kindred, and come into the land which I shall shew thee. Then came he out of the land of the Chaldeans ... into this land, wherein ye now dwell. And he gave him none inheritance in it ... yet he promised that he would give it to him for a possession, and to his seed after him" (Acts 7:2-5). Again this amazing fact is stated in the faith chapter Hebrews 11: "By faith Abraham, when he was called to go out into a place which he should after receive for an inheritance, obeyed .... By faith he sojourned in the land of promise, as in a strange country, dwelling in tabernacles with Isaac and Jacob, the heirs with him of the same promise .... These all died in faith, not having received the promises, but having seen them afar off, and were persuaded of them, and embraced them, and confessed that they were strangers and pilgrims on the earth" (Heb. 11:8-13). "For the Lord Himself shall descend from heaven ... and the dead in Christ shall rise first" (I Thes. 4:16). Human mortals, in Christ, living and dead, receive eternal life-immortality — the promises God made to Abraham — at Christ's second coming. That is when they shall put on immortality. "Flesh and blood [human mortals] cannot inherit the kingdom of God; neither death corruption inherit incorruption. Behold, I shew you a mystery; we shall not all sleep, but we shall all be changed, in a moment, in the twinkling of an eye, at the last trump: for the trumpet shall sound, and the dead [including Abraham and the beggar] shall be raised incorruptible, and we shall be changed. For this corruptible must put on incorruption, and this mortal must put on immortality" (I Cor. 15:50-53). Again, notice when Abraham and all his children co-heirs are finally to inherit the promises — the Kingdom of God, on this earth: "When the Son of man shall come in his glory, and all the holy angels with him" — notice, this is the second coming of Christ — "then shall he sit upon the throne of his glory .... Then" — and not until then — "shall the King say unto them on his right hand, Come, ye blessed of my Father, inherit the kingdom prepared for you from the foundation of the world" (Matt. 25:31-34). Jesus said Abraham would receive the promises, including eternal life, through the resurrection: "But as touching the resurrection of the dead, have ye not read that which was spoken unto you by (God, saying, I am the God of Abraham, and the God of Isaac, and the God of Jacob? God is not the God of the dead, but of the living" (Matt. 22:31-32). Jesus did not say Abraham was then living. Yet the things God has promised are so certain they may be counted as if already accomplished. Abraham, as shown above by Scripture, was and still is dead. But Jesus spoke this about Abraham "as touching the resurrection of the dead." Abraham will be resurrected. But after Lazarus died, Jesus said he "was carried by the angels into Abraham's bosom." We now know that where he was carried was not up to heaven, but into the status of a son and heir of Abraham, to inherit the land on this earth and eternal life upon it at the time his father Abraham comes into his inheritance — at the time of the resurrection. Again, Scripture reveals: Christ shall "send his angels with a great sound of a trumpet, and they shall gather together His elect from the four winds" out of their graves in a resurrection (Matt. 24:31). The time when the angels carry Lazarus and the saints into sharing the inheritance with Abraham — into Abraham's bosom — is the time of the resurrection. Lazarus is to be resurrected and carried by the angels through the air to meet Christ at His return, and to be with Abraham in the intimate relationship of father and son! Yes, how plain! Lazarus will then enjoy the fond embrace of his father through Christ, Abraham — both then resurrected and living forevermore in the promised land, then inherited! There is no doubt as to how the Bible uses the word "bosom." Turn to Isaiah 40:11. Here we find God will care for His people as a shepherd does his sheep, carrying them "in His bosom" Jesus was "in the bosom" of the Father (John 1:18), enjoying the Father's blessings and close relationship. Moses carried the children of Israel in his bosom (Num. 11:12). To be in one's bosom is to have that one's love and protection, and share his blessings and inheritance. So it will be at the resurrection. Now let's see what happened to the rich man — and when. Jesus said of him: "... The rich man also died, and was buried" (Luke 16:22). Jesus did not say the rich man was taken immediately at that time to an eternally burning hell. He did not say the body was buried but that the rich man himself was plunged immediately into a burning hell. He said the rich man died — and the rich man, himself, was buried. Now one would hardly say that the act of throwing a person into that imaginary burning cauldron luridly described as hell was a burying of the person, would he? One is not buried unless he is covered up. People are buried in a grave, and covered with earth. But the imaginary hell invented by some is never pictured as a place of burial. This rich man died and was buried. He himself was buried — not a "house" he had lived in. Jesus said so — read it in your Bible. So the rich man was in a place called "hell" after all, wasn't he? And in this hell he "lifted up his eyes." His eyes had been closed in death, and now there came a time when they opened — he "lifted up his eyes." Jesus too died and was buried. And in "hell" He too lifted up His eyes — when He was resurrected! One of the Greek words is tartaros, which refers only to the present condition of darkness or perversion and of restraint of the fallen angels or demons. Another is gehenna, a place at the bottom of a high ledge at the south end of Jerusalem where garbage, refuse, and bodies of dead animals and the worst criminals were dumped over the ledge to be burned up. Down below, the fires were kept continually burning. They burned up, or consumed — totally destroyed the bodies and refuse dumped there. This is the word Jesus used when He spoke of being finally destroyed in "hellfire." But this rich man was not buried in that "hell." He was not in gehenna. The third, and most commonly used Greek word, was written here by Luke — hades. And hades means "the grave" — a place of burial in the ground! This is the "hell" Jesus was buried in — the "hell" His soul was not left in — the grave, or tomb, from which He was resurrected! And this hades was also the "hell" in which the rich man was buried. Daniel speaks of the resurrection of the just, and of the unjust: "And many of them that sleep [their eyes closed] in the dust of the earth [their graves — buried — in hades shall awake [lift up their eyes], some to everlasting life, and some to shame and everlasting contempt" (Dan. 12:2). Here Jesus speaks of two different, separate resurrections. Quoted above are scriptures showing that the "dead in Christ" are to be resurrected at His second coming. In I Corinthians 15:22-24, we read that all are to be resurrected — but in an order of different resurrections — -Christ Himself, 1900 years ago; afterward, in a different resurrection, "they that are Christ's at his coming," and then "cometh the end" — indicating the resurrection of the unjust later. Notice now, Lazarus, with Abraham and all the saints who are Abraham's children, is to be resurrected at the time of Christ's coming. They shall live through the Millennium. But the rest of the dead shall not live until the thousand years are past. The rich man, then, will not come back to life until a thousand years after Abraham, Lazarus, and all who are Christ's have been made alive. Your Bible says, if you will believe it: "For the living know that they shall die: but the dead know not anything ... for the memory of them is forgotten" (Eccl. 9:5) — that is, they have no consciousness while dead. They are totally unconscious! Job speaks of a dead man and says: "His sons come to honour, and he knoweth it not; and they are brought low, but he perceiveth it not of them" (Job 14:21). Isaiah says our father Abraham knows nothing of us, today (Isa. 63:16). David was inspired to write: "His breath goeth forth, he returneth to his earth; in that very day his thoughts perish" (Psalm 146:4). Scripture everywhere describes the final fate of the wicked as being burned up. Their punishment is death by fire! It is this "lake of fire" which is "the second death," from which there shall be no resurrection! They remain forever dead! This death is for all eternity — eternal punishment — but not eternal punishing! How much water did he call for? He said to Abraham: "... Send Lazarus, that he may dip the tip of his finger in water." Just a couple of drops that's all the water he requested! Doesn't that strike you as strange? Why did he call for water? To put out the fires of all "hell"? the kind of hell people would have you believe he was in? Ah, no! He only wanted a mere couple of drops of water on Lazarus' finger. Why? — "to cool my tongue!" That's what the rich man said! Open your own Bible again, and read it! Why of course! This rich man opens his eyes in his grave in a resurrection. He is resurrected mortal, just as he was before he died — not immortal like Lazarus. He sees this lake of fire. Now he knows the frightful, the awful doom he is to be thrust into — to be burned up — destroyed! He is suffering mental anguish such as he never experienced in his lifetime. His tongue is dry. He breaks out in cold sweat. He cries for a little water on the tip of Lazarus' finger to cool his tongue! He is in a condition of weeping. Now once again read this in your Bible. Read exactly what Jesus said, not what the "hellfire" preachers say He said! Did Jesus say this rich man was going to suffer endlessly and forever — always burning — being on fire — yet never burning up? Did He? Of course not! Jesus was saying these things to those who would not repent. What did He want to make them understand, when He gave this account about Lazarus and the rich man? Jesus answers this question for us in Luke 13:27, 28 when He said: "Depart from me, all ye workers of iniquity. There shall be weeping and gnashing of teeth, when ye shall see Abraham, and Isaac, and Jacob, and all the prophets, in the kingdom of God, and you yourselves thrust out." Yes, they are going to be in exactly the same position as this rich man! Jesus is using him as an illustration to show these individuals what is to befall them. They are to be thrust out — into the lake of fire which shall consume them, leaving them neither root nor branch, as the Scriptures say. But Abraham and Lazarus were afar off and no water was brought. The rich man had to suffer mentally for his sins. He had had his reward, in the material things he sought, craved and acquired during his mortal lifetime. The gulf mentioned by Abraham which prevents the wicked from escaping death by hellfire, and which also keeps the righteous from being burned up, is immortality. Those who are immortal shall never die because they are born of God (Rev. 20:6). But human beings who have not been begotten and born of the Spirit of God are still flesh, subject to corruption and death. They can be burned by fire. Again in Matthew 3:12, John warned the Pharisees that they would be burned up as chaff if they didn't repent. They are to be burned with unquenchable fire — a fire so hot that no amount of water could put it out, because the flames would turn the water to steam. Malachi 4:1, 3 speaks of this fire that will burn the rich man: "For, behold, the day cometh, that shall burn as an oven; and all the proud, yea, and all that do wickedly, shall be stubble: and the day that cometh shall burn them up, saith the Lord of hosts, that it shall leave them neither root nor branch .... And ye shall tread down the wicked; for they shall be ashes under the soles of your feet in the day that I shall do this." That is the end of the wicked! They shall perish and not he any more. "Into smoke shall they consume away" (Psalm 37:20). There it is! In plain language! The experience of Lazarus and the rich man shows the resurrection from the dead — not an instantaneous going to "heaven" or "hell." It is a resurrection from the dead — not from life. It shows mortality which dies, and is dead — not immortality which never loses consciousness and lives forever in an eternal punishing of the imaginary "hell." Jesus was showing a resurrection — or bringing back to life of one who was dead of one who had no consciousness whatever of the lapse of centuries and millennia since his death. Far from illustrating immortality of the soul and the lurid eternally burning torture of "hell," Jesus illustrates death — total unconsciousness through the centuries — and the resurrection from death and restoration of consciousness. Secondly, He illustrates the second death in the lake of fire that shall totally destroy the wicked, in which they perish and become ashes under the soles of the feet of the saved — the eternal punishment of death, eternal death, the SECOND death!